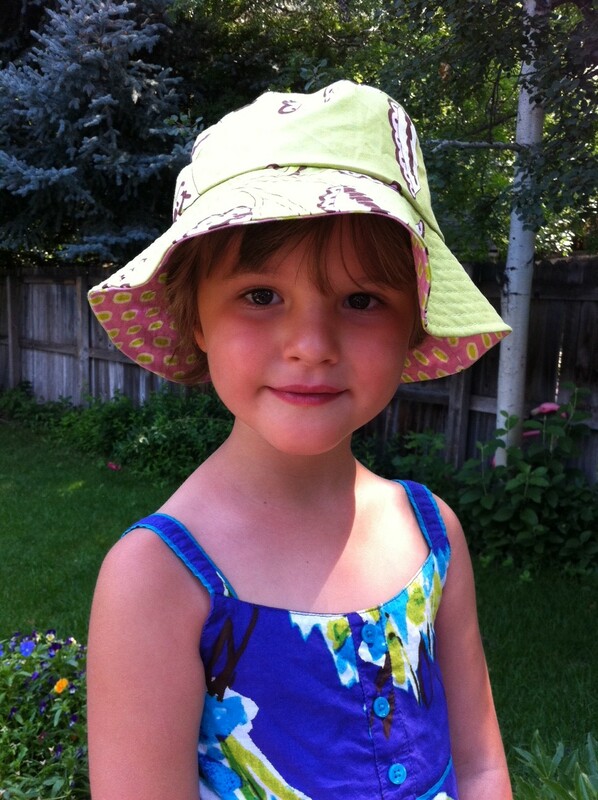 Here’s the first month’s project in the Oliver + S Little Things to Sew Sew-A-Long: the bucket hat! I can’t decide which side of this reversible hat I like best! My favorite part of this pattern and the sewing is the 1/4-inch topstitching on the brim. 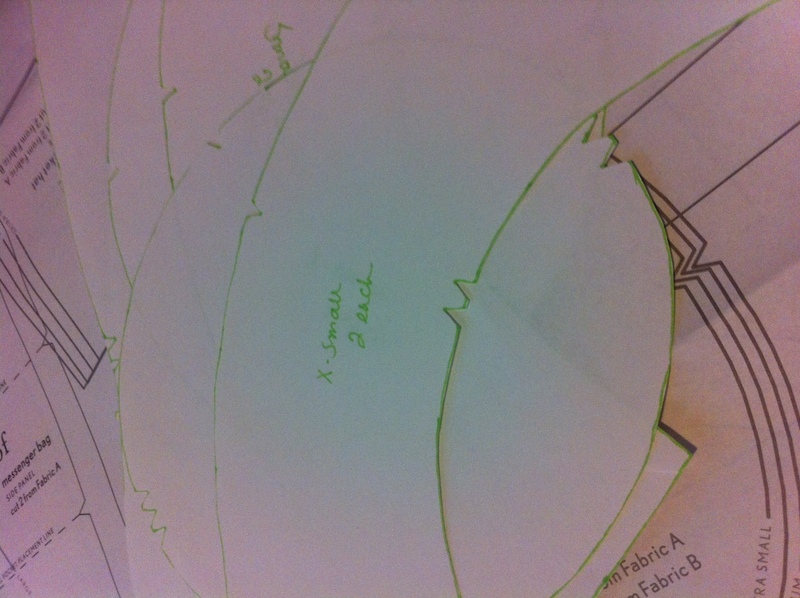 My least favorite part of the pattern is getting the rounded edges on the brim and hat to line up evenly. Though as the book suggests, along with other sew-a-longers, cutting a lot into the brim and lots of pinning, I mean lots and lots, definitely helped. This hat and its twin are now ready to make their way to help make a bright and sunny welcome for two sweet babies. And next up for me is the backpack I’m quite nervous excited to make! I’ll post some pictures of the fabric Miss A chose for her backpack soon. We’re now off to the mountains to enjoy our Labor Day. I hope everyone has a fun and safe Labor Day! I love playing WWF (Words With Friends). In fact, some may even call me an addict. In fact, they do. Though I think that’s taking it a little far. Does mentally adding up scores for words I hear or say during the day mean I’m an addict? No. Does the fact that I can’t go to bed with games waiting for my moves make me an addict? Of course not! 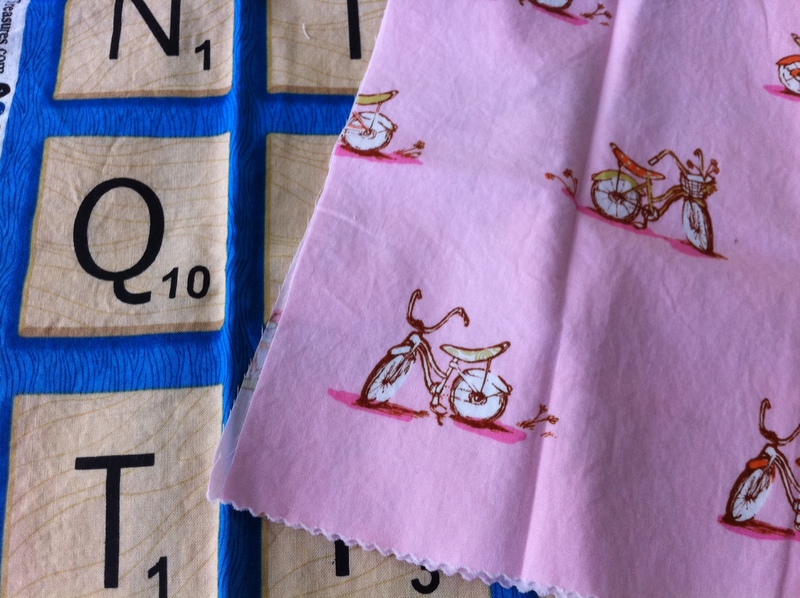 Does buying scrabble-themed fabric make me an addict? No, but it doesn’t help my case, either. These two gems arrived in my mailbox today. And, yes, that’s some Heather Ross thrown in there, too. 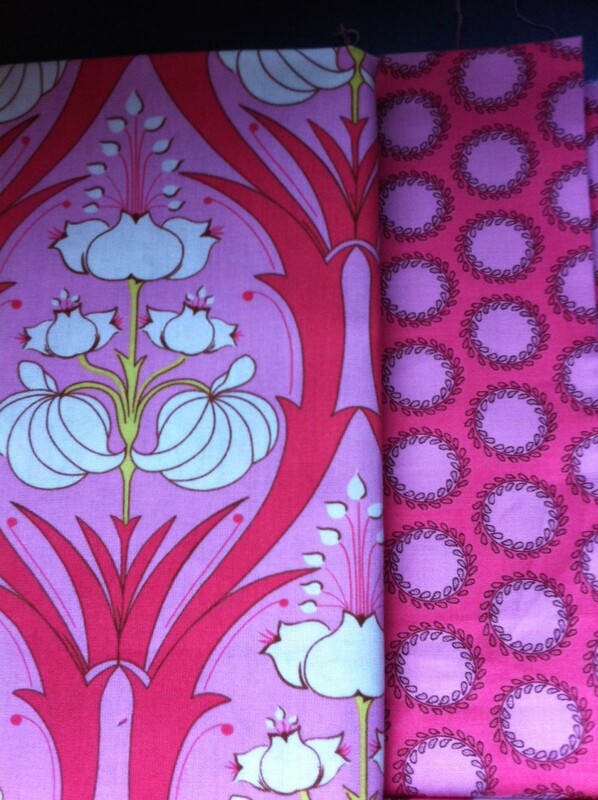 I am so excited to have gotten my hands on my first hard-to-find, out-of-print and soft-as-all-get-up Heather Ross fabric. I’m not sure what I’ll do yet with them, but for now they’re here hanging out on my desk with me. 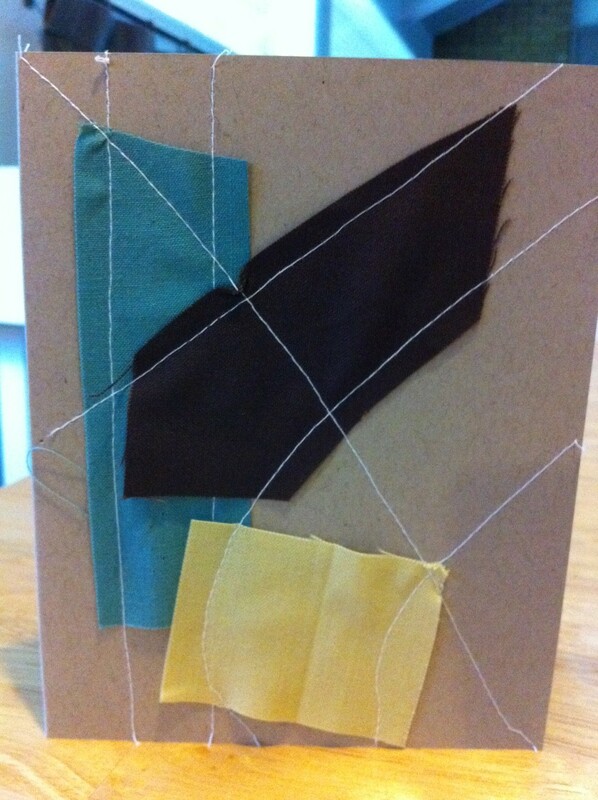 In other sewy news, I sewed up this little card to send the moolah to the lovely lady who sent me these new fabrics. On my way out the door to the post office I had the idea I’d sew up a little card for her. So was delayed by five minutes while I grabbed the blank note card, these three scraps that were at the top of my scrap bag, and randomly sewed them to the card. I think I’ll spend some time playing around with sewing my own cards. Oh, I can just imagine the possibilities between fabric choices and thread colors. Yum! 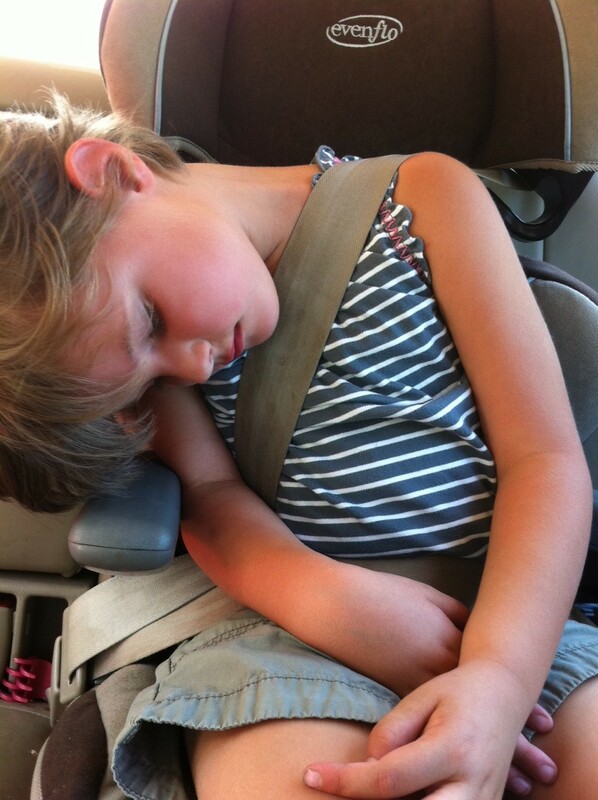 And in other news, the first week of Kindergarten has gone swimmingly well. Miss A is loving school, surprising me with her love of learning–yes, she actually said “Mom, I’d rather do puzzles than watch TV. 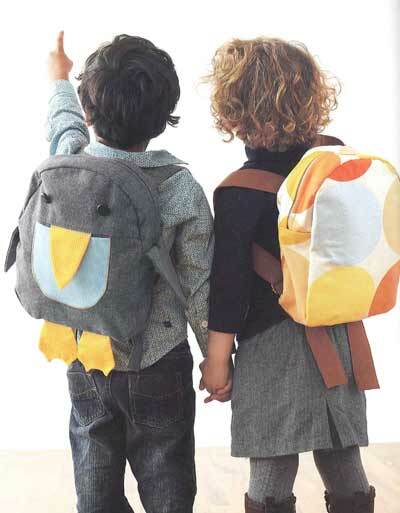 It is more fun.”– and against all odds getting to school on time. But this is how we all feel now that the week is over. Is it Friday yet? Yes, yes it is! Phew! 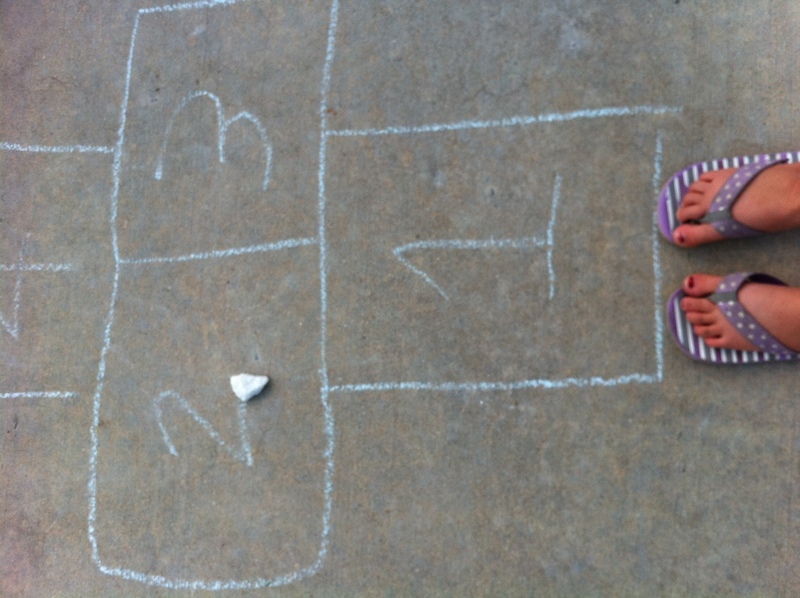 It is official…there is a Kindergartener in the house! 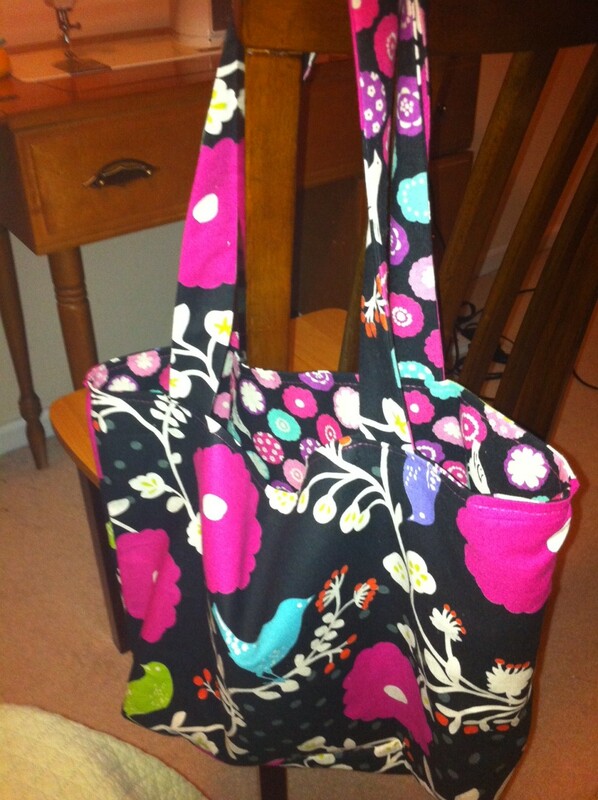 I’ve been thinking a pencil case would be fun to sew, though I’d have to conquer my fear of zippers. I’ve been looking through tutorials and so far I like this one, this one, and this one. If you have any great tutorials or patterns you’d like to recommend, send them my way! And I already have the perfect fabric picked out. We played quite a bit of hopscoth this summer, so it only seems to fit. Even though the official end to summer is September 23rd, the start of school and the last camping trip of the year have come and gone and I’m in Fall mode. I’m already looking forward to sweaters, boots, scarves, mittens, hats, and even the snow. I’m sure I’ll get over the excitement of snow after the first snow, but for now it sounds great! 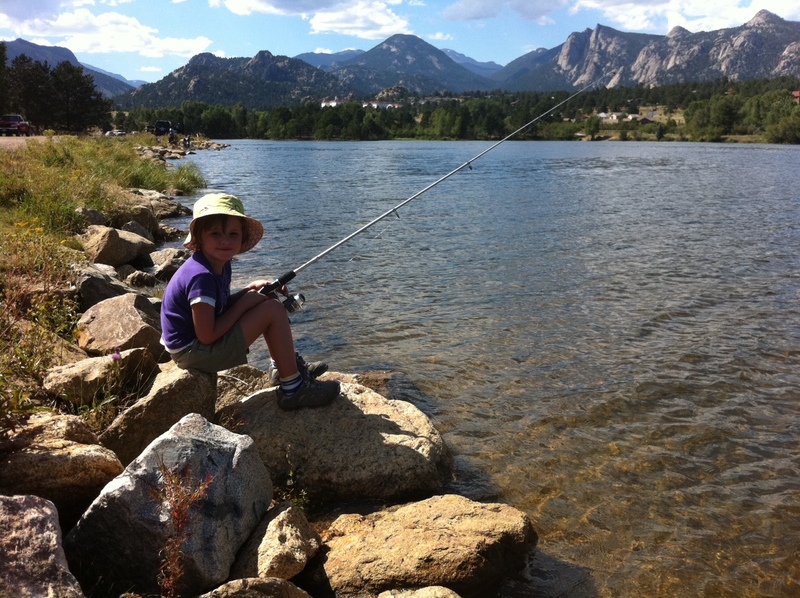 In the meantime, I’ll try to soak up the last bits of summer and look for opportunities to hopscotch, play outside with Miss A, get to the pool once more, and hopefully get one more fishing trip in where Miss A actually catches a fish. What are your plans for rest of the summer? Step 1: Cutting – Check! One night this weekend I stayed up late and cut all the pieces needed to make two of the first month’s project in the O+S LTTS SAL (Oliver + S Little Things to Sew Sew-A-Long). I think I’ll go with O+S LTTS SAL, it is easier to type and it cracks me up for some reason. My least favorite part of the process is the cutting. I’m hoping that will change over time because it can’t be escaped and is a big part of most projects. And apparently my cutting skills leave a bit to be desired. But I think I’m getting better with practice. My first step was to trace each piece of the pattern on to regular printer paper. We didn’t have any freezer or tracing paper, and I was too impatient to go wait until after a trip to the store. So away I traced. 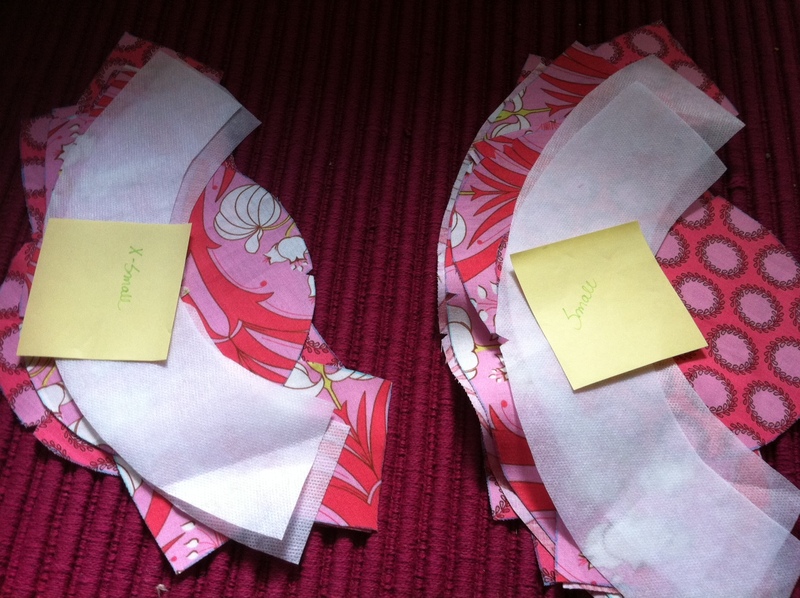 I made sure to label each cut-out piece with the correct size and the number of fabric pieces to cut from each. My plan was stay organized from the get go…which is not my usual M.O. 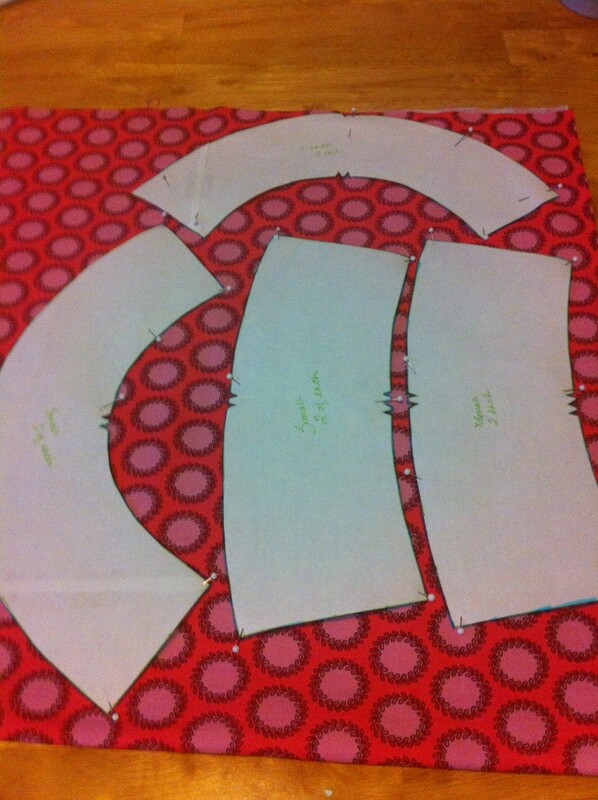 And then I cut each piece out from the first fabric. Because each piece, except for the lid of the hat, requires two fabric pieces to be cut, I was going to just fold over the fabric and cut two pieces at once. 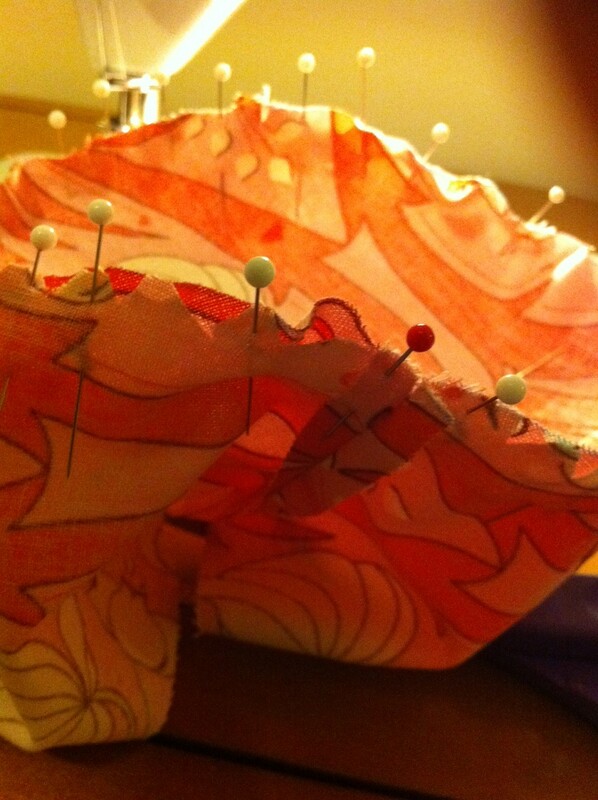 But then I chickened out on the first fabric and cut each separately. So then I bucked up, swallowed my fear, and cut two pieces at once. That is SO the way to do it! And I now have two piles (that I’ve so far successfully kept organized…yay!) that are waiting for their turn to visit Anna Mae at the sewing table to be sewn in to bucket hats and then to be sent to sweet new babies. 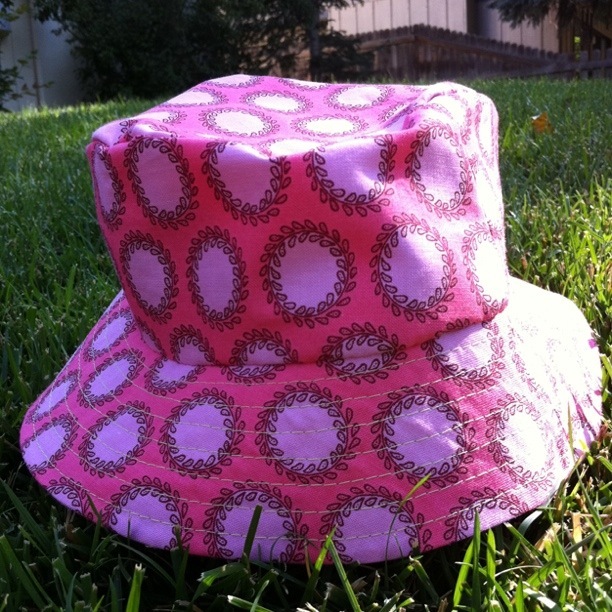 It has been fun seeing all of the in-process and completed bucket hats other sew-a-longers are blogging about. 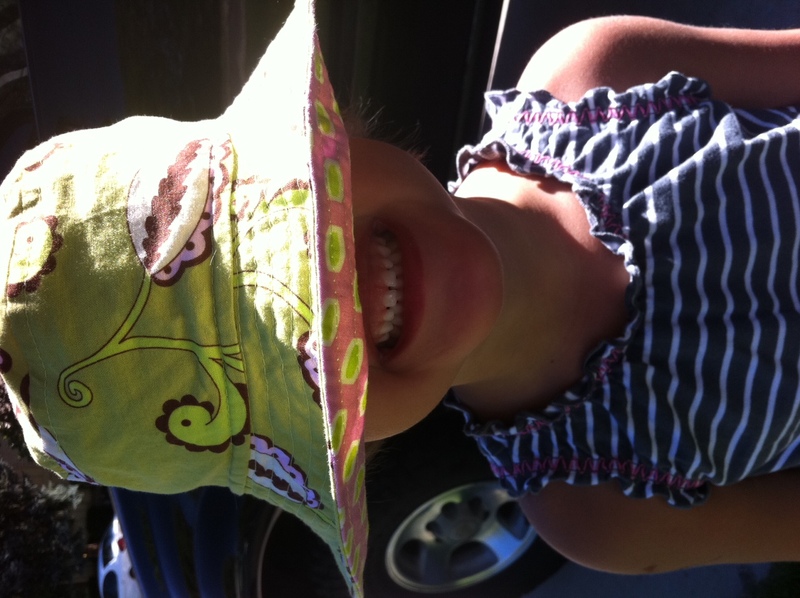 There are some fabulously outfitted kids out there sporting special, one-of-a-kind, made-with-love bucket hats. 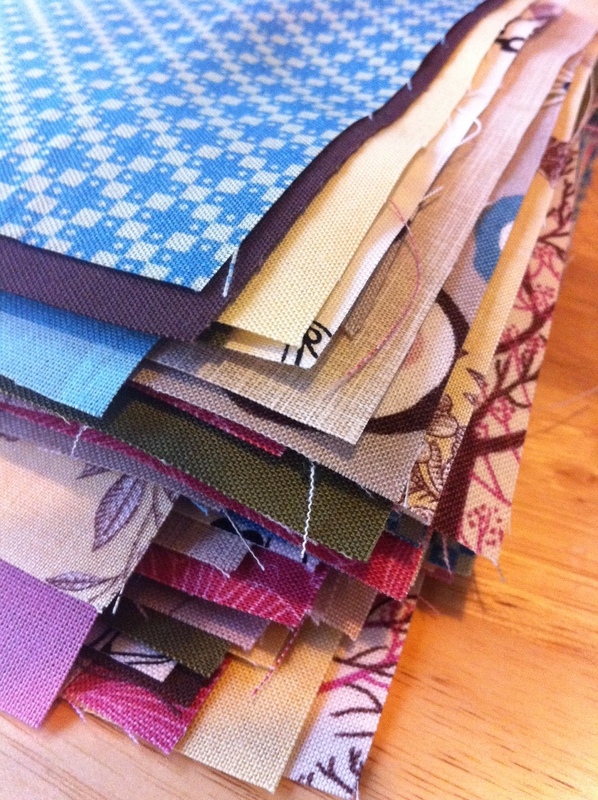 Oliver + S Little Things to Sew…Here I Come! A few months ago one of my favorite places to feed my addiction, Fancy Tiger Crafts, hosted Liesl Gibson in the shop to promote her new book, Little Things to Sew. At the time, I wasn’t aware of her awesomeness and amazing talent and the beauty of her patterns. But a sewing friend of mine said I should go and that I wouldn’t be disappointed. Boy was she telling the truth! I got a signed copy of her book and have since spent a few nights pouring through the pages imagining myself sewing up these sweet patterns for Miss A and all the other kiddos I adore. So I set out to sew something from the book. We had a camping trip coming up and I decided to make the bucket hat so it could have its debut at the campsite. In my head I had visions of fantastic pictures of Miss A in the hat with an amazing mountainous backdrop. Instead, I sewed up to the last minute and still didn’t have a completed hat and finally had to stop when car was fully packed and everyone was ready to go. Oh well. The pattern was so well written even I could follow it easily. I only had to bring it into the office once to appeal to a sewing buddy for help! And it turns out a professional and wearable hat. Yay! I made Miss A the large size and it seems to fit her head well. I’m not sure if this is a good thing or not, but apparently my head is small enough to wear the hat, too. So I’ll openly admit to wearing it myself from time to time. Though I think I’ll make myself one out of more adulty (a coined Miss A word) fabric. And there have been a few new sweet babies born the last few months who really need bucket hats, too. So I have a few more on the horizon. With that, how perfect then that I ran across the Oliver + S sew-a-long over at Jessica’s blog, A Little Gray. Each month the sew-a-longers will work on a project from the book and have the opportunity to share our questions, struggles, triumphs, suggestions, and finished projects. 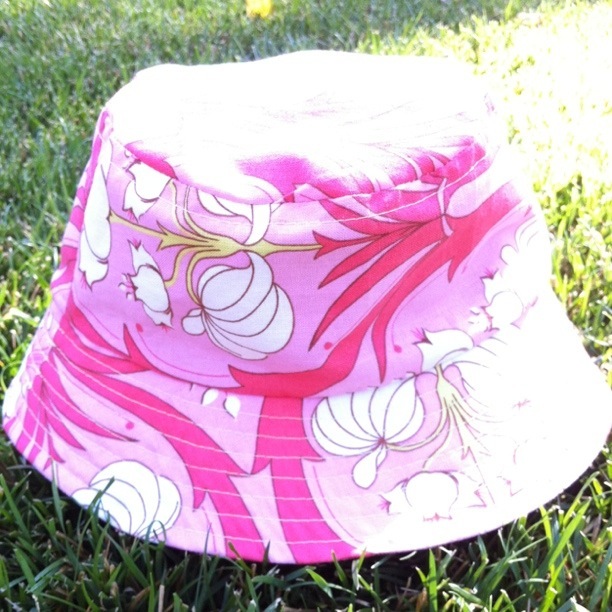 And the first month is, you guessed it, bucket hats! 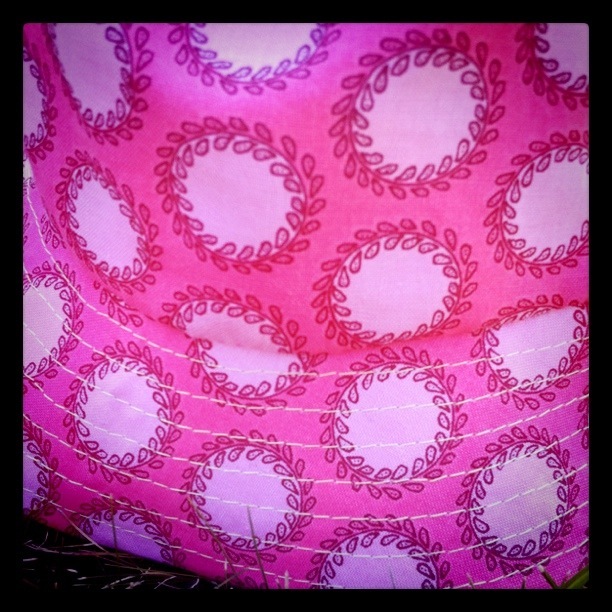 So with my new fabric picked out I’m for some bucket hat love. Where has summer gone? Here are a few snippets of summery goodness from our summer. 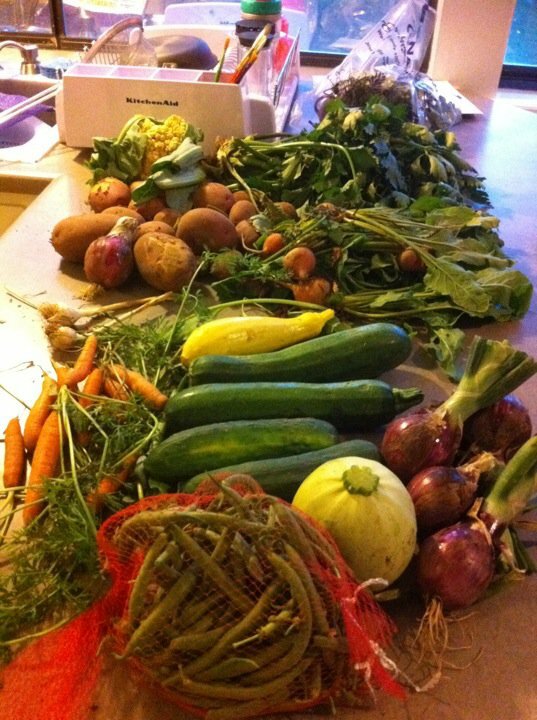 We joined a CSA and have had an abundant, vegetable-filled summer. I’ve learned how to cook all sorts of new-to-me veggies like kohlrabi, turnips, beet and mustard greens, and all sorts of other yummies. I’m already looking forward to next year! 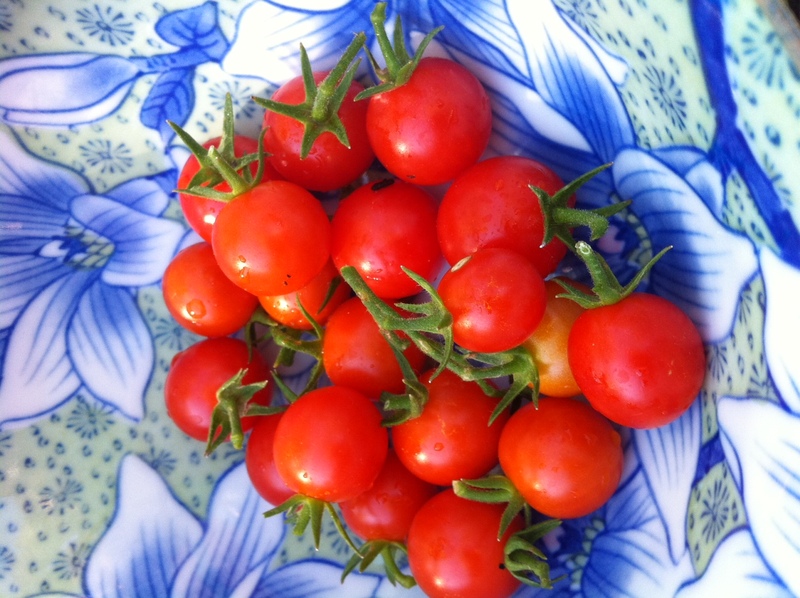 I’ve taken my first steps into the gardening world to grow some delish tomatoes and herbs. Here’s some little fellas I snipped off the vine just today. 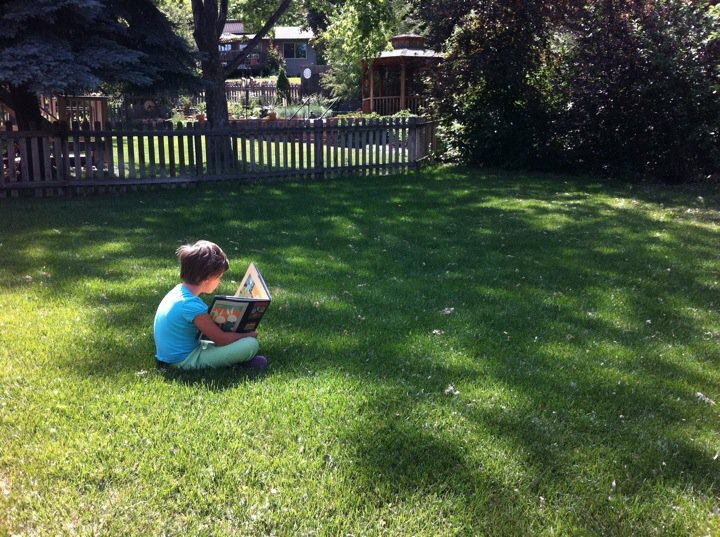 We’ve spent lots of time soaking up the sun and enjoying the beautiful summer. We took a family vacation (a first for us!) 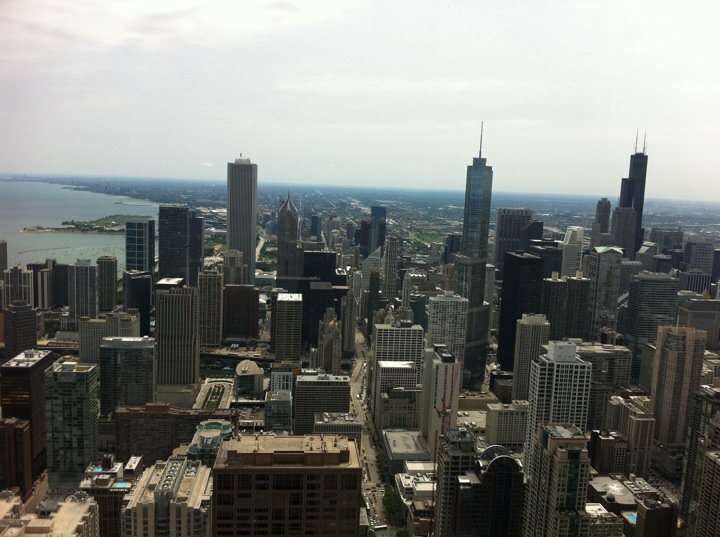 to visit the great Windy City. We all came back happy, well fed, and relaxed…so I consider that a success! 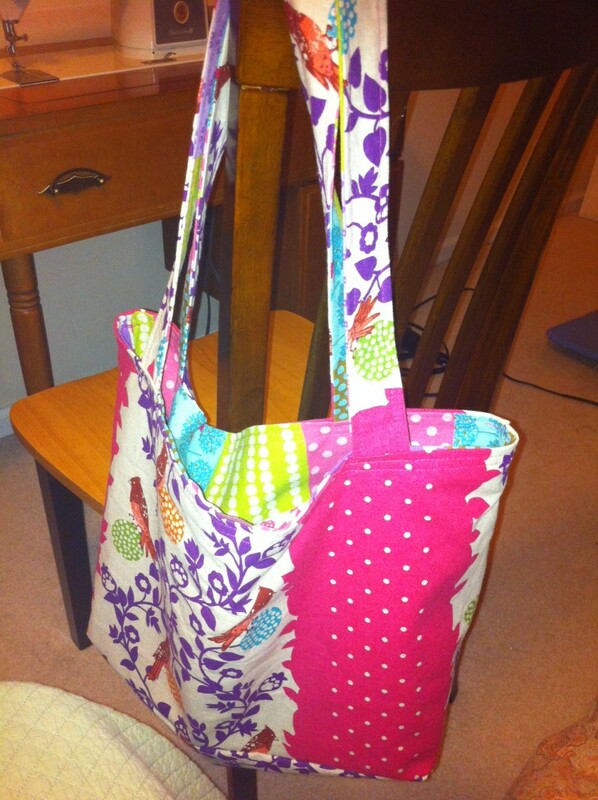 And while I’m on a bit of sewing hiatus this summer, I did manage to squeak out a few special sewing projects. I made a few tote bags as a thank you to my cousin and aunt for being such gracious and fun hostesses during my trip to Florida. I must remember to take pictures before my projects leave the house! So sad. Update: I found a few pics that reminded me once again of why I want/need a new camera. 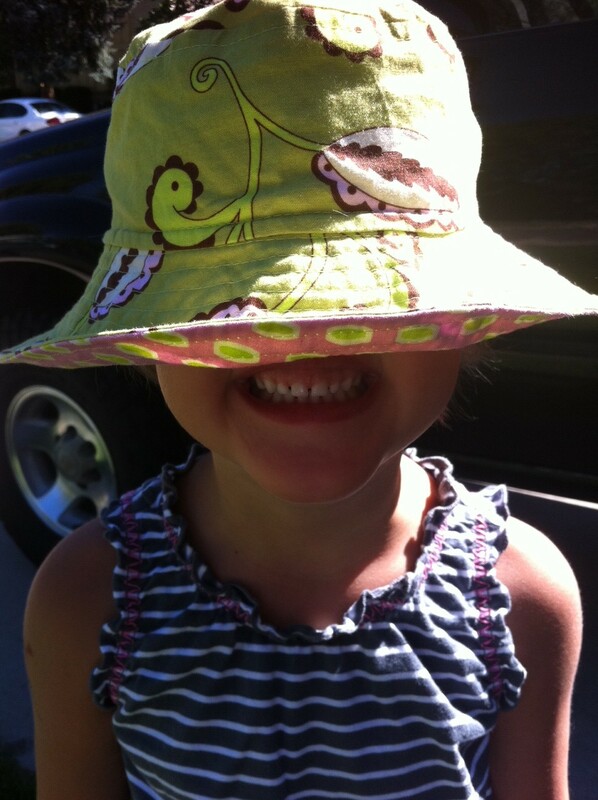 I somehow managed to bribe talk Miss A into posing for a few pictures in her new Oliver + S bucket hat I sewed. Argh! Despite rotating the pictures locally on my computer, they won’t rotate on the dang blog. So this is what I’ve got. 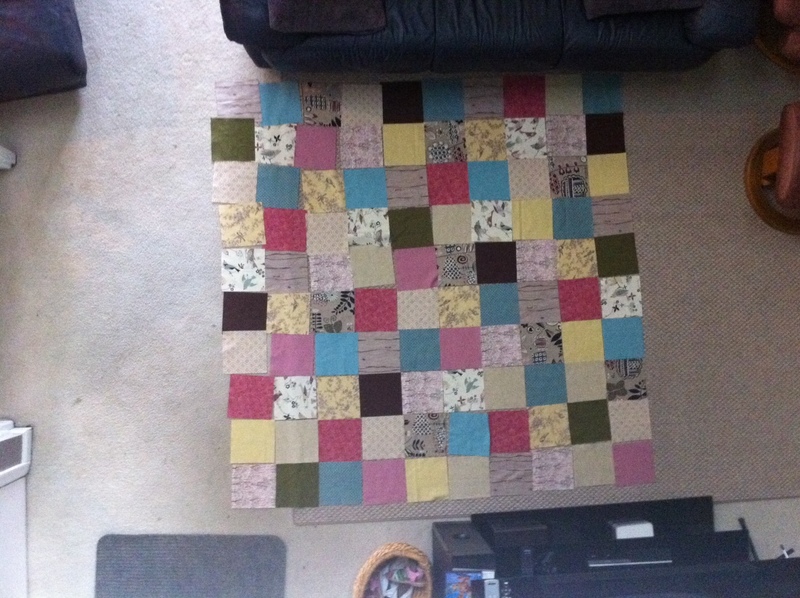 And my quilt top is done…the one I mentioned here. Yay! I just ordered the backing fabric today, so I’ll be making my first quilt sandwhich and finishing her up! I’m a little nervous and excited to quilt. Oh, and I sewed a few other little things, a pillow for Miss A’s dolls and two quilt blocks for a learning-to-quilt class series at Fancy Tiger. That’s about it. I can feel the end of summer coming fast. We’ve got one more camping trip planned and only a few weeks left of the neighborhood swimming pool fun. The days are shorter and school starts in only 15 days. (Note to self: need to go school supplies shopping!) Though with every season’s end, I look forward to the beginning of the next and all the exciting change it brings. Well, to be honest, I don’t really ever look forward to Winter. Though I’m sure when the days are short and the nights are chilly, Anna Mae and I will sit down together over a warm cup of tea and stitch to our hearts content. Here’s my current WIP (work-in-progress). Since I haven’t named it yet, we’ll just call it Quilt 1. 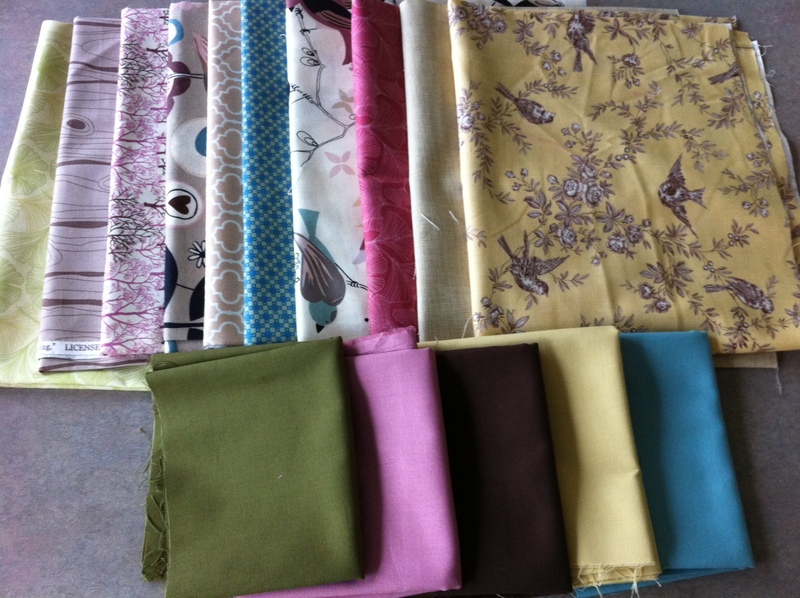 After multiple rounds of try outs, here are the fabrics I decided to go with. Well, actually, I did take the lime-greenish one on the left out as it didn’t really jive with the rest. But you still get the idea! A friend had the fabulous suggestion of adding yellow in and it adds the perfect touch of cheerfull color Quilt 1 needed. 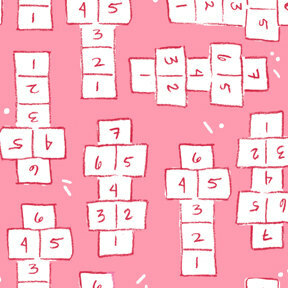 And here’s all 100 7×7 squares. And here’s one of the many layouts I tried. Anna Mae and I can’t wait to complete our very first quilt! We have already worked through three rows and we think this one will be done soon!